Book your online reservation directly with top hotels in Paris France - from two star, economy, child & family friendly lodging, first class accommodations to superior hoteles, deluxe luxury hotels and resorts. Find downtown Paris hotels, midtown, business district or airport hotels using our search engine, and find the best hotels in the Paris area for your next family vacation, romantic weekend getaways, holiday, or business trip. In Paris in the heart of the Golden Triangle and in the quiet street between Montaigne Avenue, George V Avenue and the Champs Elysees, lies a hotel that associates the brilliant architecture of the Hausmann era with a contemporary elegant style. That hotel is the Tremoille. The Hôtel des Academies et des Arts, a top boutique hotel located next to the Jardin du Luxembourg and Montparnasse, is dedicated to the creative arts. First of all because this boutique hotel chose as its home the very street where Modigliani had his studio. And secondly, because it is just across the road from the famous Académie de la Grande Chaumière, which has witnessed, over time, the genius of people such as Gauguin, Giacometti. And finally, because owners of this boutique hotel in latin quarter, Charlotte and Laurent Inchauspe, have given the painter Jerome Mesnager carte blanche to draw his famous 'white bodies'. One cannot help but fall in love with Paris, France. But the falling is that much sweeter at the Hotel Warwick Champs-Élysées. The location alone guarantees an experience worthy of the city's innate magnetic appeal and timeless romance. Steps from the most beautiful avenue in the world, the hotel sits at the heart of Downtown Paris within the Golden Triangle, which encompasses the Etoile, Champs-Élysées and Avenue George V. From those streets, the Eiffel Tower, Arc de Triomphe, the Louvre Museum and many other attractions and fashionable shopping options are mere minutes away. Inside the hotel, guests retire to a Pierre Yves Rochon-designed lobby and ambience that is chic, eclectic, inviting and unmistakably Warwick. La Clef Tour Eiffel Paris is an elegant contemporary embodiment of the Parisian art de vivre. This prestigious address offers the ideal combination of independence and personalized service in a luxurious setting. Located in Paris' 16th arrondissement, between the Trocadero and the Avenue des Champs-Elysees, the residence comprises two buildings, each with its own unique ambience. They effortlessly combine celebrated architect Ricardo Bofill's modernism with stately Haussmannian style. Enjoy the elegant atmosphere of this exceptional 19th-century building, with its wood paneling, linen drapes, fine net curtains and exquisite gilding. The tasteful color palette perfectly accents the subtly refined decor. From the K+K Hotel Cayre, all of Paris lies at your feet: c'est si bon! In close vicinity to the Quartier Latin, the K+K Hotel Cayre's location in the city centre of Paris is an optimal starting point from which you can explore Parisian sights, famous shopping streets and business centres. The best boutique hotel in Paris, the nearest metro station is also easy to reach from our hotel. Central Paris surrounds us. Get to know the city without hassle by foot: Parisian cafes, shops, and, of course, the unmistakable French flair of this metropolis on the Seine. Even in Paris, some hotels seem more Parisian than others. The Hotel Westminster, despite its regal English name, is such a place. Intimate, close and convivial, from the Haussmannian facade to the flowered, serene patio, the property exudes a joie de vivre. Located amongst the prestigious addresses of the high fashion and jewellery district, the four-star Hotel Westminster is a stone's throw from the Place Vendome, the Opera and the Tuileries gardens. For more than 200 years, the hotel on calm and quiet La Rue de la Paix has welcomed everyone from royalty - like the Duke of Westminster, from whom it takes its name - to those wanting to discover the art of living. Set on the heart of Saint Germain Des Prés, close to the Louvre and Orsay Museums, L'HOTEL La Villa, designed by Jean-Philippe Nuel, offers a contemporary place for travellers. This 'boutique' hotel, made with luxury fabrics, marble and wengé wood combines ideally the charm of a haven of peace and the must updated technology (WI fi, flat screens...) for your total comfort. 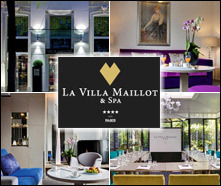 The cosy atmosphere and discreet service ensure a relaxing stay in the 31 bedrooms of La Villa Saint Germain. A warm welcome and all the attention from the front desk receptionists will allow you the best organisation for your stay in Paris. The Hotel Jeanne d'Arc offers you quality yet economical accommodation in one of Paris's trendiest, most atmospheric districts, the Marais. Our 3-star establishment has a charming decor and offers you the best value for your stay in the world's most romantic city. The convenience of a central location is the byword of our charming hotel. We look forward to welcoming you. Le Marais is a quaint, ancient district with many places of interest, including the Carnavalet Museum and the newly refurbished Picasso Museum. Its narrow, winding streets are now full of trendy, arty boutiques and all kinds of restaurants. Hotel Address: 3 rue de Jarente 75004 Paris France? In the heart of the 2nd arrondissement, Louvois Square was a focal point of Parisian life in the early 19th century. Between Mademoiselle de Montansier's opera house in Rue de Richelieu and her salons at Palais-Royal, the period's celebrities came, attracted by the queen of the French theatre and a famous name in high society. Today the same spirit reigns, impregnated with Art and History, in the corridors of the Square Louvois Hotel. In this 4-star hotel, contemporary design and 19th century Haussmannian influences are combined with great refinement. Discrete mouldings, copper touches and textured leather – French classicism contrasting with the noble modern materials. Its elegant style with Art Deco details have made it a number one destination in Parisian chic. Some 50 warm and cosy rooms convey all the authenticity of the past. With the influence of bygone charm, the lighting recalls traditional chandeliers. The softness of velvet and the simplicity of the oak flooring create a relaxed and reassuring atmosphere. The simple and comfortable forms appear side by side with the subtle Scandinavian lines, making guests feel they are at home, but also enjoying a change of scenery. The Dauphine Saint-Germain hotel is a charming 3* hotel full of character that is superbly located just steps from the Seine River and Notre-Dame Cathedral. Our warm and friendly staff look forward to welcoming you in style to share with you the best Paris has to offer. Situated in the heart of the much sought-after 6th arrondissement, the hotel sits near the Latin Quarter in the heart of Saint-Germain-des-Pres. Enjoy a prime central location during your stay in Paris just a few minutes' walk from the Louvre Museum, Musee d'Orsay and the Tuileries Gardens. The Hotel du Jeu de Paume is an authentic, secret, romantic, intimate and rare charm hotel in the Saint Louis Island, in the heart of Paris, near Notre-Dame and the Opera Bastille. The hotel du Jeu de Paume welcomes you in a chic and warm contemporary setting. You will feel its soul as soon as you will go through the carriage entrance. Every room of the Hotel du Jeu de Paume has been imagined in an intimate and refined spirit. The 30 rooms of the Hotel du Jeu de Paume are all different, and have just been completely reinvented in September 2010 and inspired by modern artists.